“A swap shop for skills and unwanted items. Totnes is full of creative people, a space where upcycling projects could take place would be great. Perhaps a donation station where fabric, bicycles, crockery or furniture could be repurposed and locals could learn to make cushions,mosaics , mend bikes etc. Ideally staffed by volunteers running workshops. it Would be great fun, help people acquire skills and keep stuff out of landfill”. “That a highly insulated space be included in the building for the making of music, recording, rehearsing, creating, learning and chilling out, ideally staffed by volunteers, so that young people have a safe and exciting place to do this”. “Include affordable workshop space for crafts people and artists,to work from”. “The Brunel building should certainly celebrate its heritage, doubled with a contrasting yet complimentary structure that emphasises the revolutionary approach that Isambard once took. As an ex media studies student from Kevicc and Kennicott Sixth Form (now studying Spatial Design at Plymouth Uni) I am very much aware of the rich film and performing arts presence in Totnes and Dartington, and think that the Brunel building could be utilised as a media hub / school run in conjunction with near-by schools and media / art groups, twinned with multifunction rooms that are available to community groups, school workshops, artists and so on- creating a sense of ownership for the community. Given the locality of pedestrian / cycle paths and major transport links the site is ready made for a park & ride system that could be situated around the existing Dairy Crest bottling hall to the north of the site’s leat, which will alleviate traffic congestion heading into the town center from the Dartington / Plymouth direction. A lengthy 200m + strip would remain, running from next to the train station through to the River Dart, foot & cycle path, also linking the Totnes-Buckfastleigh steam railway. Potentially this strip could act as the perfect public gateway for locals and visitors, almost becoming apart of peoples daily commute to work in Exeter or Plymouth, catching a bus or hiring a bicycle and heading into town, viewing local media and performing arts students work, T.T.T hosting meetings for local concerns etc. So much potential for this 20,000 sq.m + site exists. “The whole site except for the atmos building must be a Park & Ride scheme with the buses stopping that side of the station instead of the other. The present scheme means humdreds more cars in Totnes not fewer and we simply can’t cope with that”. “Include a Community Kitchen. A flexible kitchen/eating space for use by the community. Uses might include: pop-up cafe events; private bookings for groups/parties; use by local food businesses for their food preparation and/or cooking; pick-up point for veg box schemes (convenient for Totnesians who commute elsewhere for work)”. “Refurnish could have an outlet there. Various other repair and refurbishment micro workshop enterprises could then have shared shop space in which to sell their items and possibly share equipment/workshop facilities. Recover more value from waste – a reuse supercentre where all kinds of materials are available for reclamation, repair and reuse around the home and garden”. Something which incorporates elements of community-level social care, which is increasingly needed. We need plans which create a living environment in which the community can thrive and also support the most vulnerable. It could maybe include something like a Camphill type of community, creating positive life opportunities for people who need support. Or just that the community creates its own type of “sheltered” accomodation where people look out for each other and can access support when needed. I come from a river-based town, Cambridge and it thrives on a strong link with the river. With so much of the Totnes waterfront already private or residential development, it would be a shame to this opportunity to unite the water edge with Totnes in a more creative way. Other than that, I think what is already planned is great! Lots of greenery and [courtyard?] gardens please! 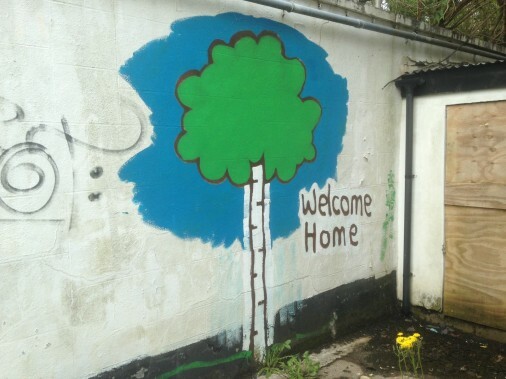 Brilliant social iniciative emerging from the community of Totnes. Really admirable and inspiring! Although I think the visions for the site so far seem to formalist and simplistic… like so many “model” examples of “sustainable” buildings and “eco”districts all over europe they seem to lack sensibility and humanity. Architecture should grow from place and people, as a social process, instead of adopting a “model”, as a product. And that is the greatest potencial of this unique initiative. Maybe you should consider an international contest of ideas for a broader view and out-of-the-box visions on what could be the transition for an ecologically and evolutionary built environment. Best luck for Atmos Totnes! A community oriented Recycle Exchange. One person’s rubbish is another’s “just what I need”. The people of Totnes seem blissfully unaware that in two weeks (30 April) a veritable local institution, the recycling depot in Babbage Road, will cease to be run by the friendly locals who seem to appreciate what recycling is all about, by not charging silly money (unlike others, at Newton Abbot and Exeter, for instance. Devon CC has awarded a new contract to French company SITA. So much for the county supporting local enterprise. And so much for all the many Totnes folk who daily can be found browsing the tables for a bargain, a hose pipe, a trunk, some picture frames perhaps, or some pretty ceramic. SITA has said it plans to close the resale section. End of an era, indeed. Thank you Devon County Council. A healthy balance of independence and community created through sharing things like a laundry, tool shed, growing food, car pool, a communal kitchen/social area balanced with the privacy of ones own eco build front door, small private outside space (roof terrace/verandah) and mutual respect for this. A vibrant local and independent economy from ground floor units used for local businesses, creatives and other enterprising and entrepreneurial people who can thrive via our support. An exhibition space where other towns and villages can visit an be inspired by what we have achieved and where we can learn from other projects. Excellent public transport links and a strong and thriving connection to the main Totnes town. “I would like to see ‘phase-change’ materials used in the buildings (self cleaning walls, walls with candle wax inside that melts and hardens depending on temperature to help keep in heat and cool the buildings etc.) and how about working with Paignton soon to set up a multistorey salad and ved growing sytem. This should be at the vanguard of cutting edge ecological design. I love waht you are doing”. “While I understand the financial need for mixed development please don’t miss the chance to also create something truly innovative, exciting and economically stimulating on the Dairy Crest site. I urge you to look at Eureka, the wonderful National Children’s Museum in Halifax. It’s beside the train station in an historic industrial building (sound familiar) and is now a honeypot for families across the NW. Why not a sustainability themed Children’s Museum SW in Totnes, with rail links to Eden Project, Dartington, TTT, Exeter Uni’s enviornmental work? It could be awesome. It’d provide year-round employment, a top quality educational attraction, real year-round economic benefits to the rest of town and make genuine use of its proximity to the railway. Housing and office space has its place but, please, Totnes could gain so much more from this site”. “The Brunel building could become an Isambard Kingdom Brunel Museum. Maybe another thing the Town Council could add to their list of interesting things associated with Totnes. Link that to the Dart Valley Railway you have tourists.I mean the greatest engineer who ever lived linked with Totnes.Shout about it. Don’t stick a posh cafe in there it would be a waste. As for Conference Centre. Torquay has one and Dartington has one. Conference Centres are two a penny”. Given the locality of pedestrian / cycle paths and major transport links the site is ready made for a park & ride system that could be situated around the existing Dairy Crest bottling hall to the north of the site’s leat, which will alleviate traffic congestion heading into the town center from the Dartington / Plymouth direction. A lengthy 200m + strip would remain, running from next to the train station through to the River Dart, foot & cycle path, also linking the Totnes-Buckfastleigh steam railway. Potentially this strip could act as the perfect public gateway for locals and visitors, almost becoming apart of peoples daily commute to work in Exeter or Plymouth, catching a bus or hiring a bicycle and heading into town, viewing local media and performing arts students work, T.T.T hosting meetings for local concerns etc. So much potential for this 20,000 sq.m + site exists. I could certainly see a media hub and park & ride situated within a public gateway populated with street furniture / green space working, whilst benefiting everyone. Whatever the outcome though, I’m sure ATMOS will ensure the best possible outcome will be achieved! “At least some proportion of the business use by Social Enterprises. At least one Social Firm”. “An alternative, and somehow low cost, health clinic”.